This is my half-hearted attempt to show some holiday spirit. 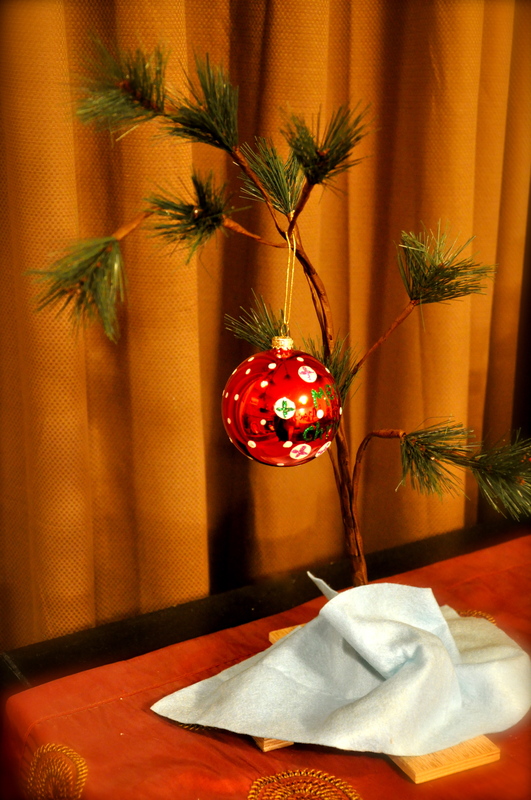 This Charlie Brown Tree is by far my favorite holiday decoration ever. It’s understated. It’s simple. It’s a little tacky. It’s easy to pack away. It’s no secret among my closest friends and family that I struggle to get excited about the holiday season. I prefer Thanksgiving to Christmas because it’s a really nice relaxed dinner and I don’t have to worry about gifts. Plus, in my neck of the woods, we always got out of school for a week during Thanksgiving for Deer Season. My strategy for Christmas never changes. From December 1st until December 23rd, I walk around in some kind of haze, blinking wildly at the twinkle lights, cursing the radio for playing silly songs about jingle bells, and avoiding department stores at all cost. I pretend like Christmas is not going to happen. What’s that? Who? When? Whatchu talkin’ bout Willis? Then, on December 23rd, I panic. My left brain kicks in, I make a detailed list and head into the fray like a bulldog. I actually am a bulldog — high school mascot — go dawgs! I then spend 30 minutes wrapping, tying ribbons and ripping apart tissue paper like a madwoman and I am victorious! I scoff at those Black Friday shoppers with their $100 flat panel tv’s. Then, I tell myself that next year will be different. I’ll start early. I’ll face Christmas like an adult. I won’t pretend it isn’t going to happen. But, deep down I’m afraid I’ll always be a last minute Christmas shopper. I didn’t instill in you the love of Christmas. The Aunt who owns easily 10 Christmas Trees and extra Decorations they Could have decorated the Rockefeller Center Tree with. Whose attic and storage building hold nothing but Christmas, etc. I can’t believe it didn’t rub off on you. And just because of you I stored my Hanging Christmas Tree. I know I should have sent it to you. How about I will it to you. I, too…have several trees. Love this time of year. When it leaves I am ready to move on though! Misti, I love your SPIRIT or lack of it! ; ) That’s what makes our family so great.